Chicago factory's rare mission: Manufacture eyewear in U.S. Millions of Americans wear glasses every day to correct their vision. But the frames are mostly made outside the country. In fact, more than 90% of eyeglasses sold in the U.S. are manufactured in China or Europe. 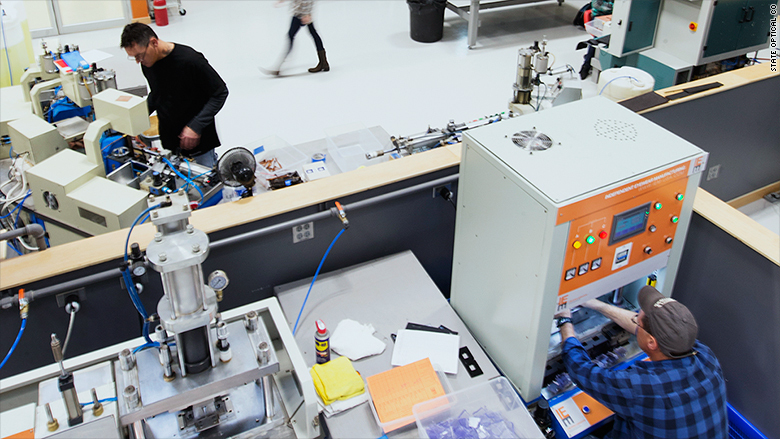 The trend didn't sit well with Scott Shapiro, founder of Chicago-based eyeframe maker State Optical Co., who sought to bring eyewear production to America. "Everyone told us it couldn't be done," Shapiro said. With hardly any eyewear production done in U.S., he faced a challenge to find the right machines and skilled workers to make it work. For 40 years, Shapiro's family owned a eyeglasses wholeshale business in Chicago and imported them from overseas. The frames were ultimately sold at optical shops nationwide. But five years ago, Shapiro devised a new plan. It takes 75 steps to make each eyeframe. "Why not make eyeframes in the U.S.?" he said. "I was waiting for the business to reach a point where we could afford to take the risk." That tipping point happened in 2012. Shapiro and his wife Amanda -- together with a few business partners -- self-funded and launched a second company, State Optical Co.
Now, the company, which makes high-end eyeframes priced between $300 and $350, is housed in a 10,000 square feet factory in Vernon Hills, Chicago. With the help of 50 workers and state of the art machinery, its first products hit the market in February 2016. They're now selling in over 500 optical stores nationwide. The high-end eyeframes are made from sheets of acetate. But Shapiro had to overcome several obstacles to make this happen. "No foreign company with [eyeframe] manufacturing expertise would partner with us," he said. "They declined because they thought we wouldn't be successful." Shapiro traveled the country to find local expertise. He subsequently met entrepreneurial cousins Marc Franchi and Jason Stanley in California and formed a partnership. "They were making small batches of handcrafted high-quality frames basically out of their garage," he said. 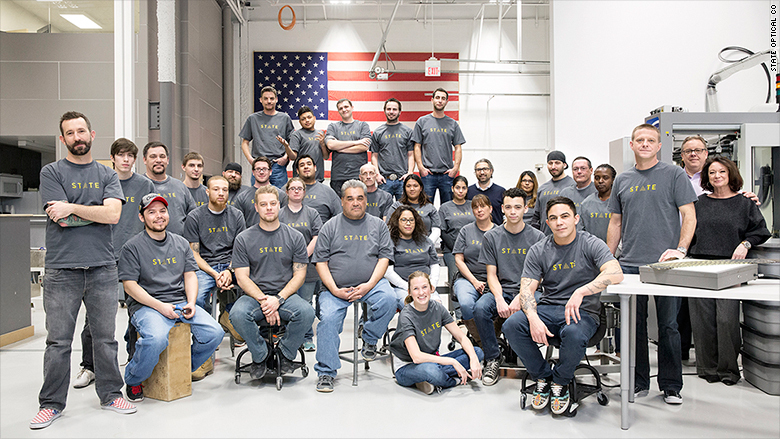 The cousins relocated to Chicago to help get State Optical off the ground, and the company hired an eyeframes designer, who was a former optometrist. Setting up the factory was a challenge, too. Citing difficulties finding the right machinery in the U.S., Shapiro ordered the machines from overseas. This turned into a lengthy process. Considering the instructions weren't in English, it took the team awhile to figure out how to use the equipment and train the workers. Almost half of State Optical Co.'s workers previously worked in the auto industry. Finding skilled labor was the next hurdle. 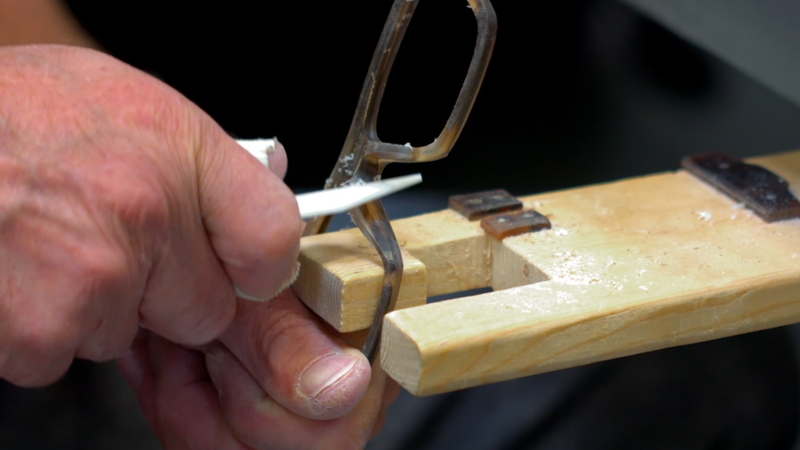 About half of the the firm's workers were previously employed in the auto or jewelry industries and underwent extensive training to learn how to make eyewear. 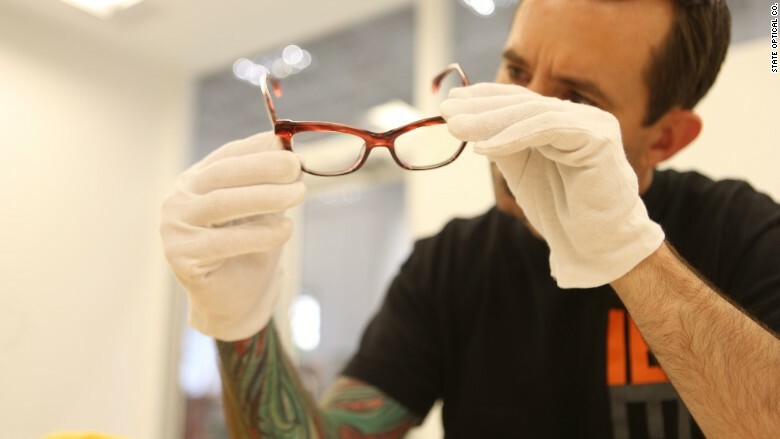 Each eyeglass frame, made from a sheet of acetate, requires 75 steps from start to finish. About half of the process is done by hand. 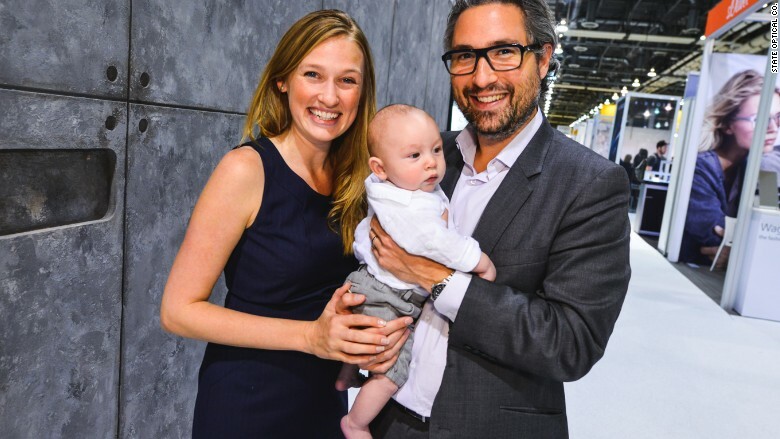 Related: Trump's win pushed this tech manufacturer to return to the U.S.
Scott Shapiro with his wife Amanda and his son. The startup, which pays an average salary of up to $15 an hour, gives full benefits, such as healthcare and paid vacation, to workers. Shapiro hopes the move will inspire other entrepreneurs to move eyewear production to the U.S..
"[State Optical] started with the belief that we could manufacture this product in the country. and put Americans to work," he said. 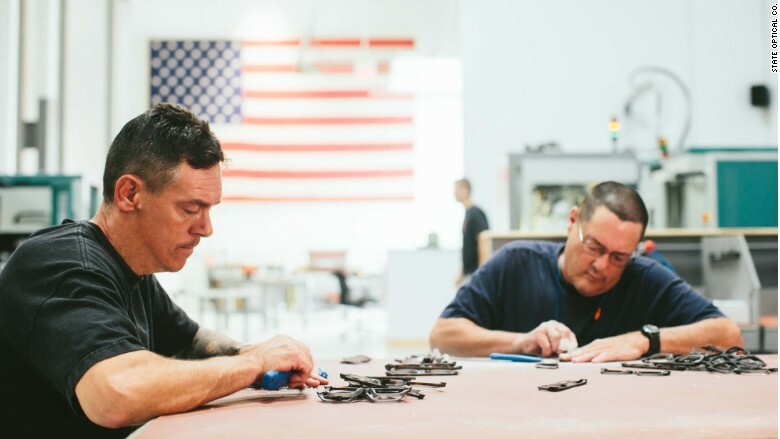 "For most who buy our eyeframes, it will be the first time wearing U.S.-made eyewear."